Safari West is a 400 acre, world class conservation breeding facility located in the rolling hills of Northern California. They specialize in maintaining genetic diversity of a range of African ungulate species, from the critically endangered Dama gazelle to the mighty white rhinoceros. Safari West also keeps an insurance population of scimitar-horned oryx, which is a species that was, until only recently, extinct in the wild. Besides their critically important conservation efforts, Safari West also provides guests who travel to their facility a unique recreational experience. The mission of Safari West is to actively promote conservation and environmental education, while sharing knowledge that empowers each individual to think sustainably about their role in the environment and the world at large. By visiting Safari West, guests directly support global wildlife conservation efforts and they learn how they can help some of our planet’s most amazing animals. 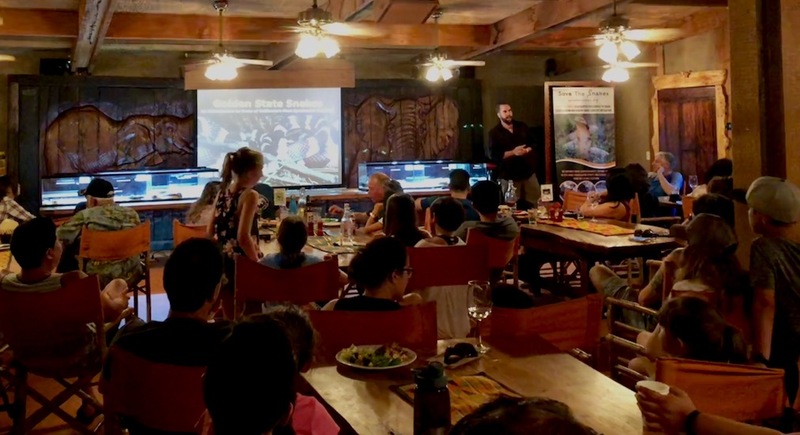 This past weekend during Safari West’s Conservation Dinner Series, about 50 people attended Save The Snakes Executive Director Michael Starkey’s presentation titled “Golden State Snakes: An Introduction to Some of California’s Most Spectacular Serpents”. The attendees learned about the ecological importance of snakes, identification of Californian venomous vs. non-venomous snakes, how to avoid snakebites, first aid and treatment in the event of a snakebite. It’s wonderful to see another community that is eager and interested to learn about snakes!